What’s the top rated portable pressure washer available today? Well, there are a lot of great pressure washers so we decided to choose some of the best models that have proven themselves to be popular with consumers because they’re reliable and efficient. A pressure washer is a handy man or woman’s dream. This machine expertly washes any hardy surface with pressurized water to leave a sparkling clean finish. Replace hours of scrubbing and a sore back with considerably less time using a power washer for better results; with the ability to be used on surfaces like wooden decks, driveways, brick walls, concrete surfaces, sturdy outdoor furniture, metal structures, tiles and even your pool, one of these machines can finish clean up jobs to a degree you didn’t think possible and cut down your workload so you can sit back and relax knowing it’s a job well done. Purchasing your own power washer is a great idea considering renting these machines can become very costly, quickly. Using your own means you can get that professional look at a do-it-yourself cost. When looking at what to buy you basically have two options; Gas powered or Electric powered washers. Gas power washers use an engine, pump and a nozzle which concentrates water flow and produces a spray pressure more that 60 times that of your garden hose. Their power output is roughly twice that of an electric power washers and is perfect for larger jobs that contain hard to remove dirt. 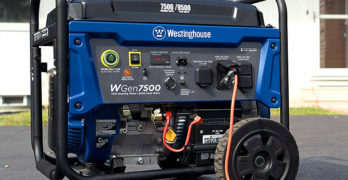 You’ll also find a greater range of gas power washers in stores. Although the great power of the gas power washers sounds great, it can cause all sorts of problems if used on the wrong surface. It can easily damage what you are cleaning depending on the materials, so extra caution is needed. It also produces a large amounts of fumes and noise that requires hearing protection. These health concerns may make you think twice as to whether the gas powered option is suitable for your project. Electric power washers also have a pump, but contain an electric motor. The use of an electric motor means you do not have to deal with exhaust fumes or high levels of noise, something your neighbors may be thankful for. There is less up-keep required for the electric motors. Their smaller size makes for an overall smaller machine. Such dimension allow for easier storage and mobility. Although there are less plug in electric models found in stores, more people are buying this option as it is cheaper. The electric power washer is easier to use for smaller jobs and there is less risk of damaging the surface your are working on. So when considering what type of power washer to purchase, it comes down to what you’ll be using it for. A larger, more difficult job may require the power of the gas powered washer. A smaller job that reflects the backyard, DIY project may need an electric powered washer. Determine the nature of your job and you’re one step closer to buying the best power washer for your needs. Now, let’s move on to our picks for the top rated portable pressure washers. There are many gas powered washers on the market. Here we will discuss and review several types, outlining their features to ensure you can make a knowledgeable decision when it comes to fixing those big jobs using high pressure machinery. Ideal for cleaning decks, patios, house siding, outdoor furniture, and prepping home exteriors for painting. The Simpson Cleaning MSH3125-S is lightweight and can easily be transported by one person. It spray provides 3100 PSI (pounds of force per square inch), 2.5 GPM (gallons per minute) of pressurized water, one of the lower amounts in the Simpson range. The Honda engine has been known to have the potential to splatter oil, but works well with the pump to produce power. The hose is of the shorter range, measuring 25 feet long and uses a threaded connection to ensure the pump, hose and gun are secure. The steel wand with which you hold is 16 inches in length and as with most power washers in the Simpson range provides nozzles at 0, 15, 25, 40 degrees and an option for soap injection. This machines’ heavy-duty welded steel frame provides stability yet a degree of movability on top of 10 inch pneumatic tires. Power boost technology provides higher pressure at the nozzle. ✓ View or download the MANUAL or the QUICK START GUIDE. The Simpson Cleaning PS4033 is built to perform. With 4000 PSI and 3.3 GPM, it provides the most amount of pressurized flow among the Simpson power washers. The Honda GX270 engine has a feature that employs low oil shutdown for protection. The pump is effective, however, there has been mention of lengthy wait times for the replacement of nonfunctional pumps. The 50 foot is the longer option of hose, which is steel braided and uses quick connect technology. This allows for easy movability of the hose, pump, and gun connections without compromising the integrity of the connection. The wand is an extensive 31 inches long with the the various Simpson nozzles provided and soap injection integration. The strong construction of this machine includes a steel axle frame and 10 inch pneumatic tires. PowerBoost technology provides higher pressure at the nozzle. The Simpson Cleaning PS3228-S provides 3200 PSI, 2.8 GPM, a flow towards the lesser end of the scale for Simpon. However the GX200 Honda engine with low oil shutdown and AAA™ Pump with industrial triplex plunger work together to supply the power you need. A threaded connection ensures all parts of the hose, pump and gun are secure. Although there are some reports of the hose breaking over time, the overall quality of the Morflex™, 25 foot hose works effectively. The wand is a comfortable 16 inches long and the machines frame sits upon 10 inch pneumatic tires for easy of transport. Includes on-board storage for spray gun/wand, high pressure hose, & nozzles. Designed for: Contractors who specialize in deck cleaning, wood restoration, paint preparation, graffiti removal, and all other heavy-duty cleaning tasks required by professionals. Includes: Pressure Washer, Hose, Gun, Wand, 5 Quick connect nozzle tips, Detergent siphon tube with filter, Engine oil, Quick start set up guide, Owner’s manual. Built for the cleaning professional, the Simpson Cleaning PS3835 provides pressured water at 3800 PSI and 3.5 GPM. Reports find the Honda GX270 engine with low oil shutdown starts easily and runs well. This power washer contains a AAA Pump with industrial triplex plunger and uses the Quick connect technology for all its connections. The hose is a steel braided Monster Hose measuring 50 feet long and attaches to a long 31 inch steel wand. The heavy duty metal frame you come to expect from Simpson is also used with this machine, however, the steel axle frame sits upon 13 inch Premium pneumatic tires. Generally larger tires are heavier, making the PS3835 slightly more weighted in comparison to other Simpson power washers. Powered by a HONDA GX390 Commercial Series Engine with Oil Alert. With 4200 PSI and 4.0 GPM the Simpson Cleaning PS4240H packs a punch. It has one of the most powerful pressurized capabilities in the Simpson range and uses a Honda GX390 engine and AAA Comet Industrial Triplex Pump to provide you with that great power. Still with all the bonuses such as a quick connect threaded nozzle and wand (measuring 31 inches long) you also get a whopping 50 feet of steel-braided hose. The 13 inch pneumatic tires and steel engine plate moves this vast machine safely. Referred to as the beast, the Simpson Cleaning PS4240H is perfect for those big jobs that require a lot of grunt. Overall, a great power washer with enough power for your home cleaning. Designed for outdoor cleaning projects including washing decks, siding, vehicles and driveways, washing cars, trucks, siding, and patios. Quickly switch between two high-pressure pre-defined spray patterns from pin-point to wide (0 and 25 degrees) for precise cleaning, plus one cleaning solution spray tip. Easy-starting engine. Lightweight, quiet and durable. Detergent Injection System : Lets you siphon cleaning solution into the water stream for even faster and easier cleaning. The Briggs & Stratton 20545 supplies less PSI and GMP in comparison to the Simpson range, at 2200 and 1.9 respectively. It still provides results for when working on large jobs by employing the power from its OHV 550e Series™ engine. It has a maintenance-free axial cam pump and a siphon hose cleaning solution injection system. The overall thoughts on the Briggs & Stratton 20545 are positive, just keep in mind that there can be difficulty in restarting the machine, as it often requires cooling down before re-ignition. A hose measuring 25 feet in length, quick connect tips and the option of 3 nozzles means the Briggs & Stratton 20545 can still get a range of jobs down with less pressurised water output. Ford makes more than just great vehicles. This is beautifully designed power washer. ✓ View or download the MANUAL or the PARTS LIST for the Ford FPWG2700H-J. Built tough for durability the Ford FPWG2700H-J is a sturdy machine that provides ample benefits. It sprays pressurised water at 2700 PSI and 2.3 GPM. The 180 CC OHV four-stroke horizontal shaft engine has three-pistons and is noted as being highly reliable. The axial pump also helps to provide appropriate power and function. The 25 foot hose still allows for adequate reach and the four independent dispersion tips allow you to modify your spray to find the type you require. The machine also has two separate soap containers that work with a chemical injector to ensure your work results in a successfully clean surface. The wand is 20 inches long and the frame structure created with strong metal tubing. 10 inch no-flat, foam-filled pneumatic wheels helps to make moving the Ford FPWG2700H-J upstairs a lot simpler, and the handle folds flat to ensure easier storage. Electric power washers are popular and provide a great alternative to effectively clean dirt and grime covered surfaces. Here the features of several types of electric power washers are outlined for you to gain the understanding of what aspects you need to look out for to assist your cleaning jobs. For small cleaning jobs this is perfect — cheap and reliable. A great value. If you don’t want to spend a lot of money then this electric model from Sun Joe gets my vote for the best cheap pressure washer for the money. It’s not fancy but it’s well-made and has proven itself to be very reliable. Just read the thousands of reviews from happy Amazon customers. The manufactures describe their Sun Joe SPX3000 as the company’s best selling power washer. This machine has a great combination of beneficial features. The 14.5-Amp motor produces 1800-Watt of power to ensure a pressurized flow of 2030 PSI and 1.76 GPM. This ensure it is able to fulfil the needs of various light, medium and heavy duty cleaning jobs. The wobble-plate piston works with TSS (Total Stop System) which means the pump automatically shuts off when trigger is released. This saves the power washer’s energy and helps to prolong the life of the pump. Two 0.9 L detergent tanks sit onboard the Sun Joe SPX3000, both which are removable. The hose measures 20 feet long and connects with 34 inch wand that has the option of 5 quick connect tips for 0, 15, 25 and 40 degrees of spray, and one for soap integration. There have been a small amount of issues with leaky hose connections. Nonetheless, the Sun Joe SPX3000 is still considered one of the easiest power washers to use. The 31 inch wheels allows for great range when cleaning as does the 35 foot power cord with a garden hose adaptor and cord lock feature. The Sun Joe SPX3001 is much like its brother the Sun Joe SPX3000 with some little added extras. Just as the SPX3000, it produces 2030 PSI, 1.76 GPM and is powered by a 14.5-amp providing 1800 Watts of power. It too has a Total Stop System and the same dimensions of hose, wand and power cord (20 feet, 34 inches and 35 feet respectively). The different features make for greater ease when using the Sun Joe SPX3001. Its onboard reel makes organizing the high pressure hose a breeze and the extra large onboard detergent tank holds 1.2 L of chemicals for continuous and effective soap injection. ✓ View or download the MANUAL for the Sun Joe SPX1000. If you are looking to complete cleaning duties that fall into the light to medium category, the Sun Joe SPX1000 could be the power washer for you. At 1450 PSI and 1.45 GPM it provides less pressurised spray than many others in the market. The smaller 11.5-amp motor produces 1400-watts and, as with many other machines in the Sun Joe Range, it employs the TSS. The hose and power cord reflect the same dimensions as its brothers; 20 foot hose and 35 foot cord.The extension wand is slightly shorter at 33 inches. The Sun Joe SPX1000 has the helpful extras of the garden hose adaptor and power cord with GFCI (ground fault circuit interrupter) protection, however, there is no detergent tank on this model, no cord lock and only the option for cold water flow. Nonetheless, purchasers feel even if it is slow in cleaning larger areas, its small size makes it easy and comfortable to use. High and Low Power Settings : Pick the perfect pressure when cleaning. ✓ View or download the MANUAL for the Sun Joe SPX4001. The Sun Joe SPX4001 has an excellent feature if you wish to tackles a wide range of cleaning tasks. This machine houses a 14.5 amp motor and the flexibility of pressure select technology, that is you can choose from two pressurized cleaning sprays. The low option is a flow producing 1450 PSI and the high option a flow of 2030 PSI. This top pressure measures 1.76 GPM. The ability to select the low pressure option assists in cleaning smaller, more fragile surfaces, whilst the high pressure option assists with those larger, dirtier jobs on sturdier materials. Still containing the Sun Joe features of TSS, a 20 foot hose, 35 foot power cord and 5 different degrees of quick connect spray nozzle tips, it also houses the onboard hose reel and wheels for smooth transport. Although some have found the hose reel clunky and the lack of warm water option an issue, over all the Sun Joe SPX4001 is a handy and versatile power washer. 13 Amp 1,700 PSI 1.2 GPM : Very good inexpensive power washer for the money. Inexpensive power cleaner for light-duty tasks. Perfect if you have a limited budget. ✓ View or download the MANUAL or the PARTS LIST for the GreenWorks GPW1702. This little pocket rocket of a power washer can help with light to medium leveled tasks and is a great machine for most of your household chores. The GreenWorks GPW1702’s 13 amp universal motor is one of the weaker on the market, however, its water resistant qualities are a major plus and can help extend the motors life. The motor produces pressurised water at 1700 PSI and 1.2 GPM. The high pressure hose measures 25 feet in length and has a reel to keep it out of the way when storing. The wand, spray gun and nozzle are sturdy and you have the option of three quick connect tips; 0, 25 and 40 degrees. The power cord runs at 35 feet with GFCI for added safety. The added bonuses of the GreenWorks GPW1702 is the ability to be used vertically or horizontally to ensure you can get in and give whatever you are working on a thorough clean from all angles. There is also handy storage for the spray gun, nozzle and wand. It is considered easy to use but be wary when assembling this machine as many have found the hose attachment to by slightly hard to put together, and causing issues if not attached adequately. Ideal for cleaning windows, cars, decks and other areas around the house. ✓ View or download the MANUAL or the PARTS LIST for the GreenWorks GPW1501. The GreenWorks GPW1501 is a slightly different design to its GPW1702 brother and has some variance in some of its features. Also using a 13 amp motor it produces the same amount of GPM (1.2) but at a slightly less 1500 PSI. The wand and spray gun resemble the same characteristics, including the three quick connect tips at 0, 25 and 40 degrees. The hose is slightly shorter at 20 feet and the GreenWorks GPW1501 has a soap applicator to ensure a sparkling finish to your cleaning. The power cord is the same at 35 feet in length, as is the ability to use the machine multi-directionally. The GreenWorks GPW1501 is considered light, compact and easy to use, providing enough power for the appropriate job. Enough power for most homeowners and very affordable. At 1600 PSI and 1.2 GPM the GreenWorks GPW1602 is in the middle range between the GPW1702 and GPW1501. With the same 13 amp motor, the GreenWorks GPW1602 provides a high quality clean for its size and power. The high pressure hose is 20 feet long High and includes a soap applicator. The two nozzle tips ensure you can select the correct spray for power washing, or cleaning more sensitive materials.The tips use quick connect technology making it easy to switch between the 40 degree tip and Turbo nozzle. The views on the GreenWorks GPW1602 are that of satisfaction in regards to size, power and cost. The size is convenient and the machine is portable with 5 inch wheels. The attachable detergent tank is a plus which allows you to keep soap close at hand and the 35 foot power cord with inline GFCI provide ample movement in the area you’re cleaning. Looking for something on a bigger scale? Many businesses use commercial power washers to maintain buildings, prepare surfaces, clean important machinery and equipment, and wash drains and pipe systems. If this sounds like you, read onto find out more. 4000 PSI / 4.0 GPM Honda powered engine. Best commercial pressure washer. Engineered for commercial cleaning jobs. Impressive power washer. ✓ View or download the SPEC SHEET for the Pressure Pro E4040HC. t’s easy to see why the Pressure Pro E4040HC seems to be a positive experience for all who have bought it. Its 50 foot hose is reinforced with steel and attaches to the spray gun using quick connect technology. The wand allows for single handed holding and can be adapted using 5 different tips (the turbo tip is sold separately). Coming in at 125 pounds the aluminium frame makes for a sturdy and strong machine that moves easily on large pneumatic tires. A beast of a machine that recruits some of the greatest amounts of power on the market. Professional grade from top to bottom. Can handle the toughest cleaning tasks. ✓ View or download the MANUAL or the SPECS for the Generac 6565. Providing the same amount of PSI and GPM as the Pressure Pro E4040HC, the Generac 6565 uses a 420cc Generac OHV engine to supply its power. The engine uses low-oil shutdown capability to minimise wear, tear and damage. The pro-grade triplex pump is also designed for maintaining a long life, with ceramic-coated pistons to withstand a great amount of output. The 50 foot steel-reinforced hose gives plenty of reach and the 5 Quick Click nozzle tips included provide the options of 0, 15, 25, 40 degree spray and a choice for soap integration. A stand out feature of the Generac 6565 is its professional spray gun. It has adjustable side handles that give the user steady and precise control. The grip has ample cushioning for comfort and an easy-to-pull trigger to reduce fatigue and ensure effective long term use. This power washer also has a pressure control valve to adapt to your jobs requirements, as well as a welded roll cage frame for great protection and oversized pneumatic tires for ease of transport. Although some have found the rattling that comes with big, heavy duty machinery is highly evident with the Generac 6565, noise aside this power washer certainly hits the mark no matter how big your cleaning job is. From all the different features, dimensions, capabilities and brands, you are hold the knowledge to determine the requirements of your cleaning tasks, and what the best power washer is for you to complete those jobs with a high quality finish.